Shackleton war eine der herausragenden Persönlichkeiten des sogenannten „Goldenen Zeitalters der Antarktisforschung“. Er nahm an vier Antarktisexpeditionen teil, von denen er bei dreien als Expeditionsleiter tätig war. Obwohl er im Nachruf durch die Presse als Held gefeiert wurde, geriet sein Name im Gegensatz zu dem seines Rivalen Scott bald darauf für lange Zeit in Vergessenheit. Erst zur Jahrtausendwende wurde Shackleton als vorbildhafte Führungspersönlichkeit wiederentdeckt, die es in extremen Situationen vermochte, ihre Untergebenen zu außergewöhnlichen Leistungen zu motivieren. Polarforscher (1874-1922). Autograph letter signed ("Ernest H. Shackleton"). S.S. Discovery. 4 SS. auf Doppelblatt. 8vo. Long, enthusiastic letter to one "Mr. Douglas" about the first year of the Discovery Expedition, the first official British expedition to Antarctica since Ross in 1842: "I cannot in the space of an ordinary letter give you the details of an experience such as has been mine in the last year, but when I get home I will be able to explain all things to you and aided by photos supply what may be wanting in descriptive power. After our departure from Lyttleton and Port Chalmers it wasn't long before we were in the pack ice, and our stout ship was crashing through mightly floes and every now and then reeling back from the shock, but in 5 days we forced our way through and were in clearwater once more: We, on the 9th of January made Cape Adare, landed and placed a record there, then steamed down the Coast of South Victoria Land, getting the position as we went. Wonderful were the Sights we saw: Mightly icebergs: and huge glaciers, and nearly the whole time at least for a week the sun shone brilliantly day and night. Two very anxious days were spent off Coulman Island in a gale and after leaving a record there we went down to Cape Crozier and along the great Ice Barrier which Ross had followed for 450 miles and we were fortunate enough to penetrate farther East and discover newland: Warned by the young ice forming we hastened back to [...] quarters which we had yet to discover: On our way we entered an inlet in the Barrier and sent the Balloon up: I went up 700 feet: but no sign of land could be seen: we got it down and let the gas out just in time as a strong wind was springing up from the South. On Feb. the 8th we went down Mac Murdo Bay and found splendid Winter Quarters. On the 19th I was given a small party to make a sledge reconnaissance to the South West in order to see what chances there were for us getting to the South: by sledge journeys I ascended an island 2720 feet high and had a clear view shewing Barrier surface as far as we could see. Some are now making preparations for the Southern trip: We got fairly low temperatures during the winter which is now coming to an end, the lowest we have had was -47° F so far but it will be lower before the sun returns. Our paper ["The South Polar Times"] I think is a success so far: and we have frequent concerts and plays so that the darkness is not noticed, and time does not hang heavily on our hands. One unfortunate accident deprived us of a man [George Vince]: he being lost in a blizzard out sledging, by falling over a cliff into the Sea: otherwise for a broken leg and minor accidents everyone is well. The man who broke his leg did so out on ski. I do hope that the coming summer will enable us to make good progress in geographical work and that I may be lucky enough to be chosen for one of the long trips by sledge. My diary will be able to give you a full and accurate account of our doings and I will have it sent you when I send it home, as I know you have always taken an interest in my work: and I have felt always that in you I have a friend who understands really what a sailor's life is [...]". 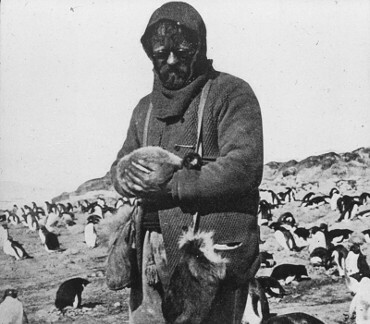 - The Discovery Expedition launched the career of many eminent polar explorers, among them Robert Falcon Scott. - On stationery with printed letterhead of the "Discovery Antarctic Expedition 1901"; with small traces of folding, p. 1 somewhat dusty, otherwise in mint condition..
Polarforscher (1874-1922). Collection of two albumen prints (vintage). Lyttleton (Neuseeland) und Antarktis. Jeweils 82:105 mm. Depicting the great explorer Shackleton (1874-1922) in his tweed suit on deck of the "Discovery". Numbered "0001" in the negative; captioned on reverse: "Shackleton on arrival at Lyttleton". The "Discovery" under the command of Robert Falcon Scott had left England on 6 August 1901 and reached New Zealand on November 29. Three weeks later, the expedition left the port of Lyttleton, sailing for Antarctica. - The second photograph shows the "Terra Nova" with smoking funnel in pack ice, probably in McMurdo Sound, where the ship had been sent to assist in freeing the "Discovery". In the middle ground, a sailor is seen stepping across the floes. Captioned on reverse: "'Terra Nova' in Pack Ice". - The "Discovery" expedition was the first official British expedition to Antarctica since Ross in 1842 and introduced the "Heroic Age" of Antarctic expeditions. - Well-preserved prints showing rich contrast..